Ottawa, ON, May 16, 2016 – According to statistics released today by The Canadian Real Estate Association (CREA), national home sales in April 2016 rose to their highest level ever. 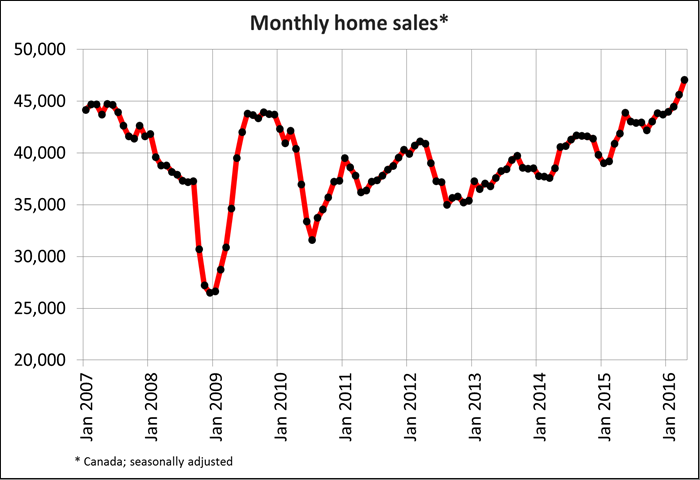 National home sales rose by 3.1% from March to April. Actual (not seasonally adjusted) activity was up 10.3% compared to April 2015. The number of newly listed homes was little changed (-0.2%) from March to April. 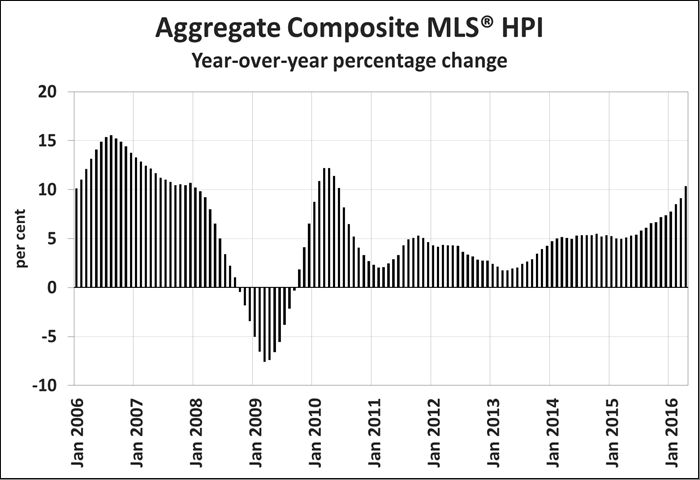 The MLS® Home Price Index (HPI) rose 10.3% year-over-year in April. The national average sale price climbed 13.1% in April from one year ago; net of the Greater Toronto Area and Greater Vancouver, it was up by 8.7% year-over-year. The number of homes trading hands via Canadian MLS® Systems in April 2016 rose by 3.1 percent month-over-month to set a new monthly record. Sales were up in April compared to the previous month in about 70 percent of all local markets, led by the National Capital Region and Edmonton. Following small declines the previous month, activity held steady in the Greater Toronto Area (GTA) and edged lower in Greater Vancouver. 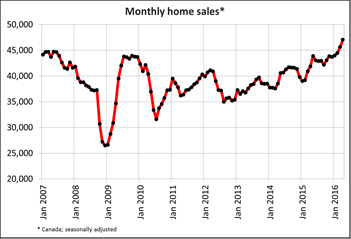 Actual (not seasonally adjusted) sales activity rose 10.3 percent from one year ago to shatter all previous records for the month of April. It also marked the second highest level for transactions for any single month and stood 16.5 percent above the 10-year average for the month of April. Activity was up from year-ago levels in about 70 percent of all local markets, led by a number of markets in British Columbia as well as the GTA. Newly listed homes edged slightly lower (-0.2 percent) in April 2016 compared to March. The number of markets where new supply rose and where it fell was fairly evenly split. New listings were up most in Edmonton and on Vancouver Island but fell in the GTA, London & St. Thomas as well as Newfoundland & Labrador. The national sales-to-new listings ratio rose to 64.5 percent in April 2016, the ratio’s tightest reading since October 2009. A sales-to-new listings ratio between 40 and 60 percent is generally consistent with balanced housing market conditions, with readings below and above this range indicating buyers’ and sellers’ markets respectively. The ratio was above 60 percent in about half of all local housing markets in April, virtually all of which are located in British Columbia, the Greater Toronto Area or in Southwestern Ontario. There were 4.7 months of inventory on a national basis at the end of April 2016, the lowest level in more than six years and a reflection of increasingly tighter housing markets in B.C. and Ontario. The number of months of inventory currently sits at or below two months in a growing number of local markets in British Columbia, the GTA and environs and in Southwestern Ontario. 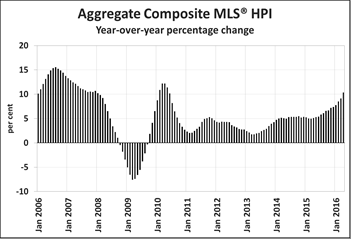 The Aggregate Composite MLS® HPI rose by 10.3 percent on a year-over year basis in April 2016, the biggest gain since May 2010. For the third consecutive month, year-over-year price growth accelerated for all Benchmark property types tracked by the index. Continuing the trend seen in recent months, two-storey single family home prices posted the biggest year-over-year gain (+12.3 percent), followed by townhouse/row units (+9.8 percent), one-storey single family homes (+9.4 percent), and apartment units (+7.9 percent). While 9 of the 11 markets tracked by the MLS® HPI posted year-over-year price gains in April, price growth among housing markets continues to vary widely. Greater Vancouver (+25.3 percent) and the Fraser Valley (+25.6 percent) posted the largest gains, followed by Greater Toronto (+12.6 percent), Victoria (+12.0 percent) and Vancouver Island (+8.2 percent). By contrast, home prices fell by 3.5 percent and 2.4 percent in Calgary and Saskatoon respectively, which are smaller declines than those posted by these markets in March. Year-over-year price growth advanced further into positive territory in Regina (+1.9 percent) and edged higher on a year-over-year basis in Ottawa (+1.1 percent) and Greater Montreal (+1.3 percent). Home prices in Greater Moncton recorded their ninth consecutive year-over-year gain, rising 6.6 percent from where they stood one year earlier. The MLS® Home Price Index (MLS® HPI) provides a better gauge of price trends than is possible using averages because average price is prone to being distorted by changes in the mix of sales activity. The actual (not seasonally adjusted) national average price for homes sold in April 2016 was $508,097, up 13.1 percent on a year-over-year basis. The national average price continues to be pulled upward by sales activity in Greater Vancouver and Greater Toronto, which are among Canada’s tightest, most active and expensive housing markets. If these two housing markets are excluded from calculations, the average is a more modest $369,222 and the year-over-year gain is reduced to 8.7 percent. Even then, this reflects a tug of war between strong average price gains in housing markets around the GTA and in the Lower Mainland of British Columbia versus flat or declining average prices elsewhere in Canada. The average price for Canada net of sales in British Columbia and Ontario in April 2016 was down 1.7 percent year-over-year to $301,951.